Underground Parking Garages - Ino-Tek Inc. Underground Parking Garages represent a significant risk of exposure to hazardous materials through vehicle exhaust. 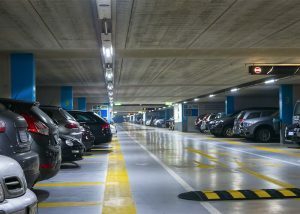 Without continuous ventilation, Underground Parking Facilities can see a rapid buildup of toxic chemicals like Carbon Monoxide (CO) and Nitrogen Dioxide (NO2) – which are common byproducts of vehicle exhaust. Detection of Carbon Monoxide or Nitrogen Dioxide at dangerous levels requires an immediate increase in ventilation. Gas Detection and ventilation monitoring are required by building and fire codes for most underground parking areas. As CNG and Propane technologies move forward, there will be additional sensing requirements due to the flammability and explosive potential for these new vehicle fuel sources.